Photo by irina88w / Getty Images Plus. The smooth granite-texture finish of this resurfaced concrete driveway counterbalances the crisp angles of the house. Like diamonds, real estate is an investment that usually holds its value. And, as diamonds have a handy group of “C” words to describe key attributes (carat, cut, color, clarity), real estate has a handier group of three “L” words: location, location, location. Two other words critical to real estate are curb appeal, which influence a first impression, perhaps the only impression. 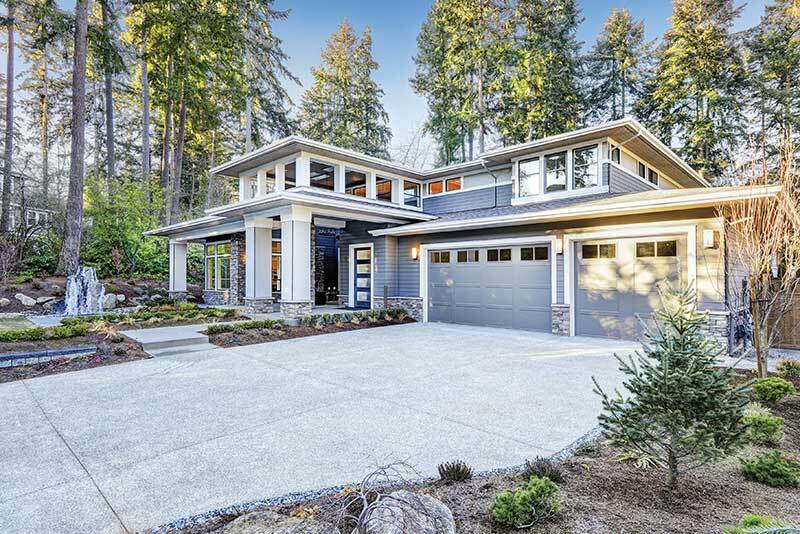 While a home may be impressively built and stunningly designed, something as simple as the driveway can frame its high points or initiate a sense of dissatisfaction. Concrete driveways, while practical in nature and generally the cost-effective choice for contractors, can be cracked, damaged and stained by weathering and extreme temperatures. It takes little time for them to become unsightly, which, let’s face it, kicks curb appeal to the curb. But even plain concrete can be repaired and given an added layer of reinforcement that resurfaces it and creates visual appeal. Whether you’re working with a preexisting slab that’s been cracked and damaged or you simply want something with a more luxurious look, the concrete can be resurfaced with layers of textured spray that helps repair areas of damage, reinforces the concrete and seals it from the elements. Or, if the look of stone suits your fancy, you can hire a concrete contractor to create customized, stone-like patterns that incorporate color into the design. “Homeowners often want to improve the look of their driveways — for their own enjoyment or to improve their property value and the appearance of their home when they’re trying to sell — without the expense and mess of removing and replacing the concrete,” says Rory Fairly, CEO of CTI Color-Crete in Fort Walton Beach. “We have developed techniques for decoratively enhancing concrete driveways with customized designs that create a durable upgrade to the existing surface. It is beautiful and works with their cracked concrete without having the added expense of removing and replacing it. Experts will tell you that proper installation is vital to achieving a lasting surface. “It’s key to thoroughly clean the concrete first with an acid compound and power wash it before the cracks are repaired — but the repairs have to be done properly or they will become a recurring problem even after the concrete has been resurfaced,” says David Veazey of Emerald Coast Concrete Designs, LLC, in Pensacola. Once the cracks have been repaired, a base coat is applied over the concrete surface and then sprayed in a four-step process with the texture and colors of the client’s choosing, Veazey explains.